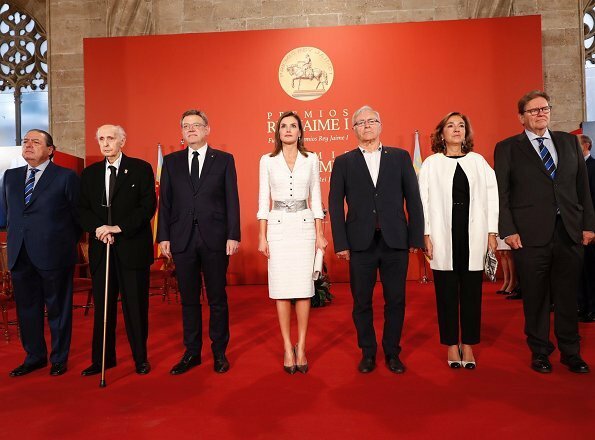 On October 30, 2017, Queen Letizia of Spain attended the presentation ceremony of the 'Rey Jaime I Awards' held at Silk Exchange building (Llotja de la Seda) in Valencia. The winners of the 2017 edition are: Fernando Martín, Basic Research; Carmen Herrero, in Economics; Anna Maria Travaset, Environmental Protection; Susana Marcos, New Technologies; Josep Dalmau, Clinical Medicine and Alicia Asín, Entrepreneurship. Que bella. Me encantan los cinturones anchos en ella. Not even Angie will find anything good to say about this outfit. So tight it's a wonder she can breathe, and the horrible silver belt. A total fail from head to toes. Why do you think, she can't breathe? The dress is a slim fit, but she is slim. She can wear it. The bouclé material looks soft, not stiff. I wonder what designer it is? Is it a Chanel dress? A black belt and shoes would have been more classic. 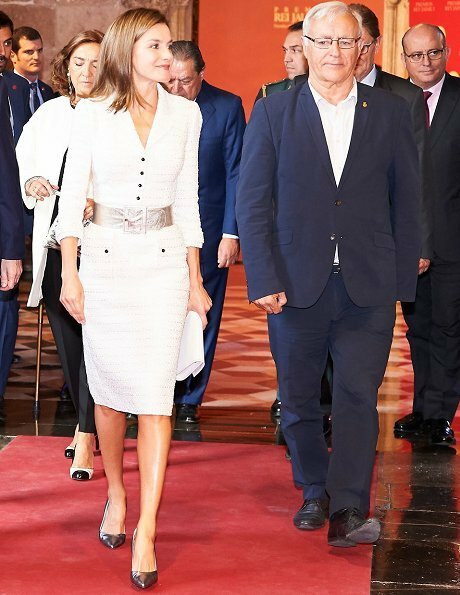 Bu as she wears a laid back hairstyle and almost no jewelry, apart from the beautiful classic earrings, I think the silver belt is okay. Is from Felipe Varela, her favorite designer. The designer is, once again, Felipe Varela. Of course, Felipe Varela! Did anyone find the dress? Which collection? Apparently, there are many silver wide belts in this collection. At first I thought it was the same tweed piece she was wearing in Paris, but I was wrong. This is a new dress with silver hardware and metallic thread woven into the tweed fabric. This gives meaning to the silver belt. Thank you @SIlvia, for these informations. The dress seems to be customized for her, I also couldn't find it. Exactamente mi pensamiento Beth. Ella se toma su trabajo para lucir adecuadamente. The wide belt is a miss because she looks too tight, but silver accesories re a good choice. These photos don't let you appreciate the nice fabric of the dress, with a silver thread throughout. It's too tight and the belt rather cheapens it. The style and colour are good and it should have worked. Not one of her best efforts. I like this outfit but I would have preferred this dress with slim belt vs. this bulky and big-buckled belt. Agree with Beth: Letizia surprises us with new hairstyles all the time. This time her hair look sleek and simple, yet elegant and professional. Yes, it is makeable! Beautiful ensemble. 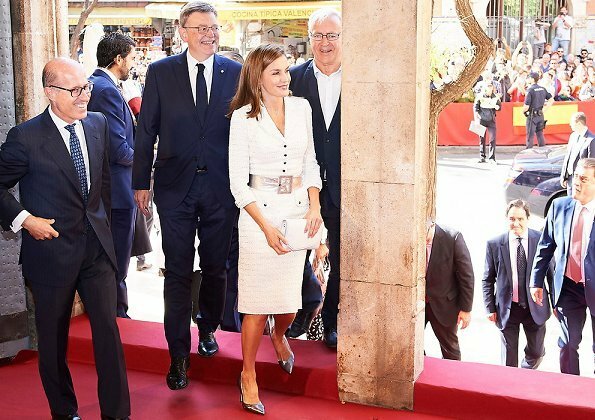 Queen Letizia hardly ever puts a foot wrong in the fashion stakes. Precioso vestido, elegante y funcional al mismo tiempo. A mí me gustan mucho los cinturones anchos en Letizia, porque tiene la figura perfecta para ellos. La que no pueda, que no se los ponga. Muy acertados los complementos plateados y los pendientes son maravillosos. Beth, la peluquera de Leti se llama Luz Valero y es la misma que la peinaba cuando trabajaba en la TVE. Estoy de acuerdo en que es muy imaginativa y profesional. 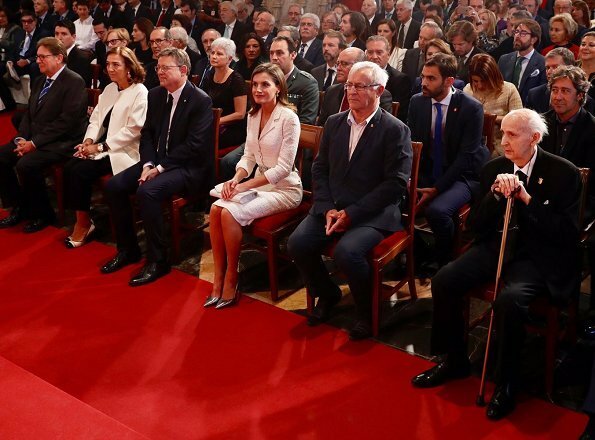 Thank you @ Angie, I did some research on Luz Valero, I admire her work very much, especially her updos and plaits, but actually all styles she performs on Letizia's hair. Perfectly wonderful!